What do the big numbers from small wind’s annual report mean? 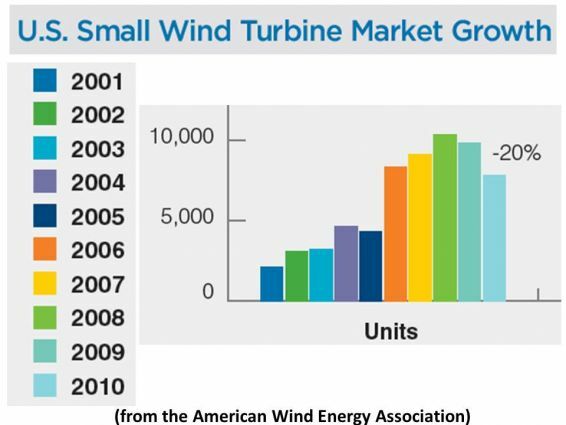 U.S. small wind added 25.6 megawatts of new capacity in 2010, a big number for an industry that typically adds capacity in increments of one to ten kilowatts at a time. 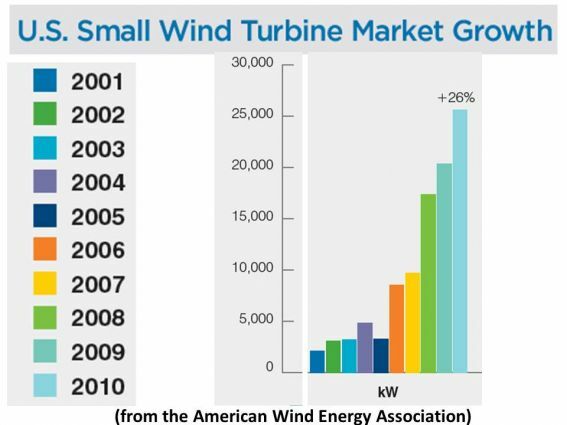 The numbers, just released at the American Wind Energy Association (AWEA) Small and Community Windpower Conference, showed impressive growth. They also showed impressive resilience with a strong performance in a troubled economy. The industry estimated that there were 144,000 small wind systems in place in the U.S. at the end of 2010 generating 179 megawatts. The numbers revealed a new trend. Installed kilowatts were up and sales revenues jumped 53 percent, producing $139 million. But the number of units, estimated at 8,000, was down slightly from the preceding year, showing “a shift to larger turbines and applications that are beyond the residential market” and more suited for farms or businesses than for backyards, according to Larry Flowers, AWEA’s Deputy Director for Distributed and Community Wind and the author of the 2011 small wind market report from which the numbers were previewed. The numbers showed something new. Nine of ten small turbines sold were connected to the grid and the portion of installed small wind capacity that was hooked to the grid exceeded 90 percent for the first time, a strong indication that small wind is becoming part of the wider trend toward distributed energy. This year’s market report put the 2010 average installed cost of small wind turbines (installed in the U.S.) at $5,430 per kilowatt. Last year’s report merely estimated the number at between $3,000 to $6,000 and noted that small wind was cost competitive with photovoltaic systems. 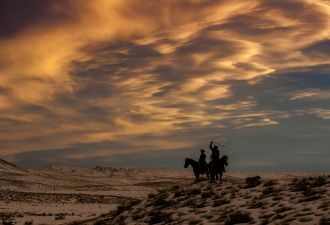 The implication is likely that small wind is preparing to compete for its place in the distributed energy marketplace. Numbers showed the international small wind market changing. Last year, U.S. manufacturers dominated the global marketplace. This year, there were almost as many international companies with over a megawatt in sales (six) as there were U.S. companies (seven). The biggest competition, though numbers are not yet available, came from Asian manufacturers. 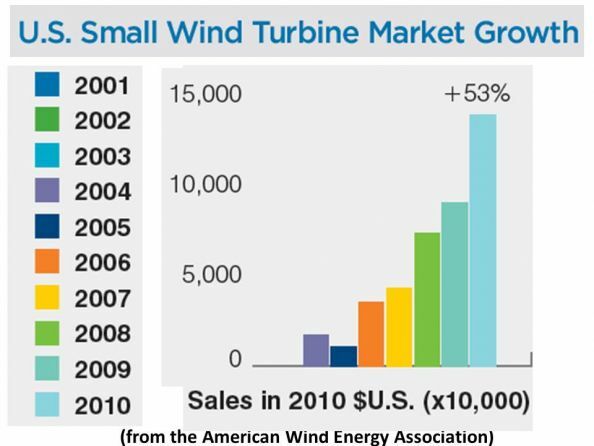 The good news: 80 percent of the content of small wind turbines made in North America in 2010 was domestic. More good news: The small wind sector supports an estimated 1,500 full-time-equivalent U.S. jobs. Federal, state, utility and local agency rebates, tax credits, grants, low-interest loans and other forms of 2010 funding assistance was over $30 million. It amounted to half of U.S. turbine sales by capacity (12.4 megawatts). Grants and loans from the U.S. Department of Agriculture’s Rural Energy for America Program (REAP) and the U.S. Treasury’s 1603 grant payments represented more than half of that (amounting to 6.8 megawatts in 30 states). Small wind was biggest last year in California, followed by Wyoming, Ohio, Arizona, Colorado and New York. Industry leaders agreed. They presently assume the 1603 grant program will not be renewed for 2012 and that the extension of REAP is in doubt. Probably the most important long-term developments for small wind in 2010 were the establishment of the Small Wind Certification Council (SWCC), four regional small wind test centers and the North American Board of Certified Energy Practitioners (NABCEP) Small Wind Installer Certification Program. These promise a standardization of small wind quality which, industry leaders expect, will eliminate utility resistance, substantiate institutional financing, and secure consistent incentives -- all of which should lead to better economics and more growth. The single biggest barrier to small wind growth is onerous permitting, zoning and regulatory rules. 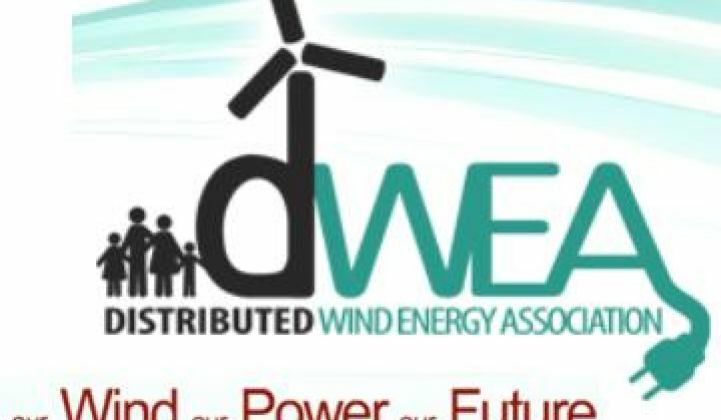 The Distributed Wind Energy Association (DWEA) was established in 2010 to address this issue.